Last spring, around the time parents stop placing the signs with last names in car windshields at carpool, I posted some important etiquette rules for afternoon pick up at school (see original post here). Since most parents of school aged children are in the middle of back to school, I thought it was worth re-posting my carpool etiquette list. For those of you who missed the first post, I would like to remind you that I am a carpool caller at my school. I have a Madonna microphone and everything. I was not originally selected for this job. My teammate had been tapped for the position and cried when she found out, so I volunteered to take her place. It got me out of the commons area duty which is where the students sit while waiting to be called. I thought the caller job was better. I may have been wrong. Rule 1: Most schools give signs with the family’s last name, children’s names, or carpool group information clearly written. The sign is supposed to sit on your dashboard somewhere. Keep your sign in the window of your car ALL year round. When your child is not standing next to you, and you are wearing sunglasses, the carpool caller does not know your name or who you are. Rule 2: Tip the sign up a little when you get within range of the carpool announcer. 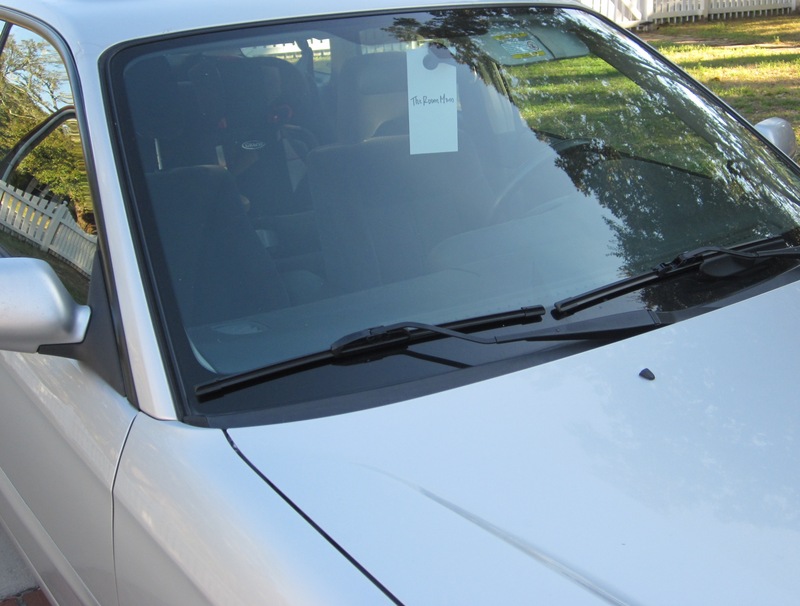 If it is sunny, and the light is reflecting off the windshield, we can’t read the sign resting on your dashboard. If it is raining, and the windshield is wet, we can’t read the sign resting on your dashboard. Basically, anything resting flat on the dashboard is hard to read. Tags that hang from the rearview mirror are easy to read. Parents can hang their tag from a clippy hanger and hook it onto the rearview mirror during carpool or write the last name on a door hanger (like the kind hotels have), and it will improve visibility quite a bit. Rule 3: No extraneous conversation of any kind. 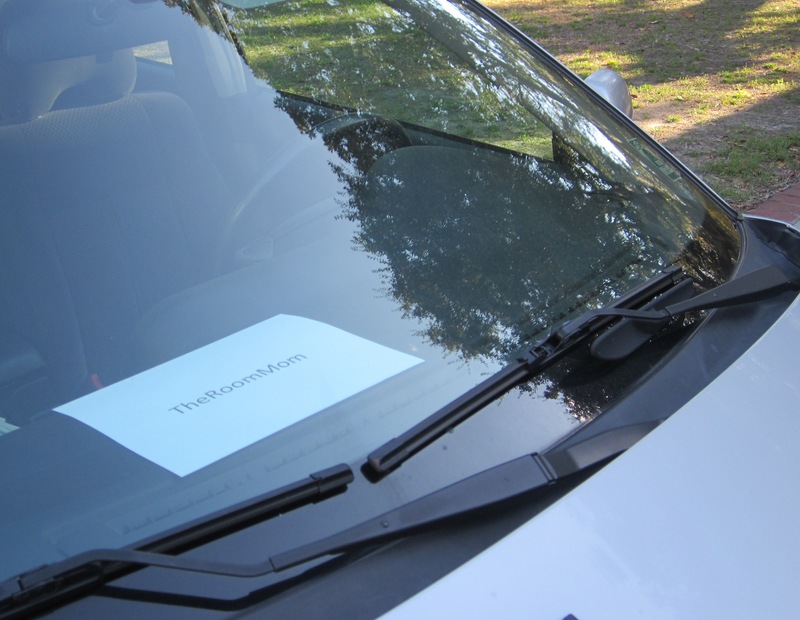 The only time you need to talk is to let the caller know who is riding in your car if you don’t have the sign in the windshield (refer back to Rule 1 and please put the sign back in your windshield). Don’t try to ask questions about homework or have a parent/teacher conference with the carpool caller or the loaders. The caller is counting cars. She/he can’t have a parent teacher conference and announce names at the same time. The loaders are trying to get children in seats as quickly as possible to move the whole line forward. Rule 4: Stay in your assigned slot unless asked to move forward by a faculty member. If you hear the caller announce your child’s name at position 3, or the green cone, or whatever it is at your school, go to that position and wait. If the cars in positions 1 and 2 load and pull away, continue to wait at station 3 unless a teacher waves you forward. If you pull forward thinking you are making room for more cars, you reshuffle all of the students. I am The caller is still down the block calling numbers based on your number 3 position. Once students are lining up at the wrong carpool stations, it slows down the whole system. Rule 5: Order Remind your child to listen for his/her name while in the “holding” area. Rule 6: Teach your child to clip a seatbelt. This rule does not apply to nursery school aged children. Rule 7: Have children practice getting in the car with their belongings a few times. P.S. Little kids are not ready for giant wheelie backpacks. If you need help with morning drop off tips, you can read a totally hilarious (not PG) carpool blog post from the Hot Mess Mom’s perspective by clicking here. What are your carpool pet peeves? Everyone with school aged children has them. Wow. You work at one seriously organized school. I give you a lot of credit for even volunteering for that job. Do you worry that you did such a good job that they might have you do it again this year? Last year at my HS (“my”, like it’s mine..haha), they installed a parent drop-off lane because the staff was sick and tired of almost getting killed by parents as they dropped off their happy teens in the morning. For the most part it worked, until there was almost a parent altercation because someone didn’t move up quickly enough. Now the Principal has to stand there in the morning. (Maybe I should tell him he needs a microphone!) We still however, have parents that choose to completely ignore the drop-off lane day after day, because they “don’t have time for that $@%&”! Of course they don’t. I guess it doesn’t matter what level you teach when it comes to the lunacy of drop-offs. Luckily, we are unscathed thus far with pick-ups. Wishing you a great school year! I think all bets are off when you hit high school. I taught in a high school for a few years, and those kids were on their own after that last bell rang. I have no idea what happened during drop off because I was down in trailer town on the last row. P.S. Fixed your typo in the comment!